To date, data on muscle involvement during HIV infection remain sparse and we aimed to describe the clinical characteristics and evolution of biopsy-proven HIV-associated myopathies. All HIV-positive patients who had a muscle biopsy performed at the Pitié-Salpêtrière University Hospital between 2001 and 2012 were identified. Medical records were retrospectively reviewed to assess muscle disease features and HIV infection characteristics. Patients were classified histologically as polymyositis (PM), non-specific myositis (NSM), immune-mediated necrotizing myopathy (IMNM), or inclusion body myositis (IBM) according to the European Neuromuscular Center (ENMC) criteria.3 4 Isolated mitochondrial abnormality (IMA) was defined as presence of cytochrome c oxidase negative fibres and/or succinate dehydrogenase positive staining without inflammatory cell infiltrate or rimmed vacuoles. PM or NSM evolution towards IBM was evaluated at follow-up. Uncontrolled viral load was defined as >40 copies/mL. Categorical variables are reported herein as numbers and/or percentages and were compared using a χ2 or Fisher’s exact test. Quantitative variables are reported as median (IQR1–IQR3) and compared using non-parametric one-way one-way analysis of variance (ANOVA). For all statistical analyses, p<0.05 was considered significant. Statistical analyses were conducted using GraphPad Prism software. Fifty HIV-positive patients had a muscle biopsy (figure 1). Median age at first muscle biopsy was 49 (43–54) years, 66% of patients were male and age at HIV diagnosis was 36 (30–46) years. At first muscle biopsy, 64% of patients presented myalgia, 52% displaying muscle weakness, with a median CK level of 728 (220–1373 IU/L, median CD4+ T cells count of 398 (237–568) cells/mm3 and median HIV viral load of 0 (0–11 383) copies/mL. Twenty-four percent of patients had viral coinfection (either hepatitis B or hepatitis C virus). Patients features at first muscle biopsy and longitudinal course at last follow-up. ARV, antiretroviral; IBM, inclusion-body myositis; IMA, isolated mitochondrial abnormalities; IMNM, immune-mediated necrotising myopathy; PM, polymyositis; NSM, non-specific myositis. 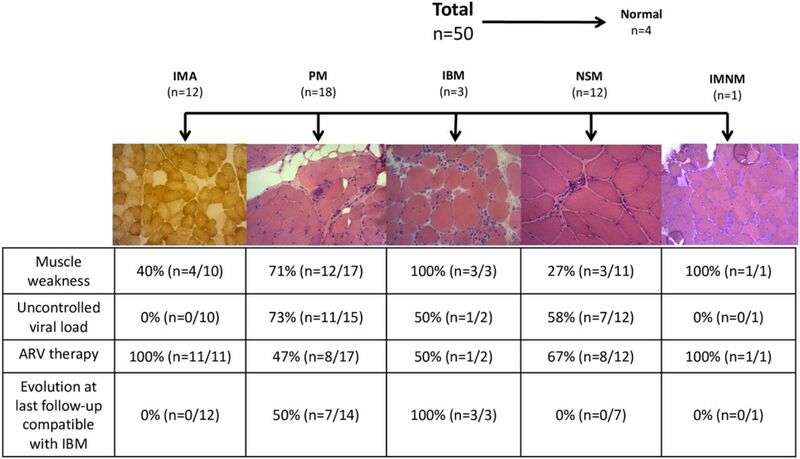 Forty-six patients had an abnormal muscle pathology (figure 1) and were classified histologically as follow: 39% PM (18/46), 26% NSM (12/46), 26% IMA (12/46), 7% IBM (3/46) and 2% IMNM (1/46). Muscle weakness occurred more frequently among cases classified as IBM and PM compared with IMA and NSM (100%, 71%, 40% and 27%, respectively, p=0.04). HIV viral load was significantly more elevated in PM with a median of 601 (32–55 809) copies/mL (p=0.003) compared with other subsets. Noticeably, all patients displaying an IMA pattern had previously been or were currently treated with antiretroviral therapy and all had controlled viral loads (p=0.034) at the time of the muscle biopsy. We subsequently focused on NSM and PM, two histological patterns associated with muscle inflammation, in order to assess their possible evolution towards IBM at follow-up. Clinical follow-up was available for 58% (n=7/12) of NSM and 78% (n=14/18) of PM patients and time from first muscle biopsy was 6.0 (4.3–8.0) years. Two NSM patients and six PM patients also had repeat muscle biopsies performed at 2.3 (2.1–5.9) years after first biopsy. Following first muscle biopsy among these patients, ARV therapy intervention was performed in 60% (n=9/15) of NSM and PM patients, consisting of either ARV introduction (n=2 NSM and n=3 PM) or modification (n=3 PM and n=1 NSM). One of five NSM patients received high-dose (≥40 mg/day) corticosteroid (CS) and four of six PM patients received moderate (20–39 mg/day)-high dose CS. Fifty percent of PM patients (n=7/14) displayed an evolution compatible with IBM at last follow-up, including: immunosuppressant resistance (n=5/7), physician-reported muscle disease worsening (n=7/7), finger flexors and/or quadriceps involvement (n=4/7) and histologically defined IBM on repeat biopsy (n=3/7). On the opposite, seven PM patients and none of the NSM patients developed these features. At last follow-up, viral load was undetectable in 78% of patients (including n=6/7 NSM and n=8/11 PM). There was no difference in the viral load between patients with and without IBM evolution at last follow-up. The present study is the largest one reporting biopsy-proven HIV-associated myopathy. Three main histological patterns were observed: IMA, PM and NSM, associated with different muscle features, HIV viral load and antiretroviral therapeutic profiles. Since IMA is a known complication of antiretroviral therapy, we focused our study on NSM and PM cases presenting with inflammatory histological patterns. A recent study5 has reported 11 HIV-positive patients with PM who eventually developed IBM after ≥1 year of follow-up. In the present study, we report two histological patterns associated with muscle inflammation, namely NSM and PM, which have two very different prognoses. Indeed, none of the patients with NSM developed IBM while only 50% of those with PM eventually developed IBM after 6 years of follow-up. Interestingly, in a subset of 11 PM patients, most (82%) had detectable viral load at first muscle biopsy compared with 22% at last follow-up. In other words, not all patients with PM-HIV developed IBM and PM-HIV may have been responsive to ARV therapy +/−immunosuppressant intervention. On the other hand, in the subset of seven NSM patients, muscle features resolved with viral load control +/−immunosuppressant intervention. These findings may suggest a role for uncontrolled viral replication in the pathogenesis of HIV-associated myositis. One strength of our study is the duration of follow-up after the first muscle biopsy to assess possible evolution of PM-HIV towards IBM. Due to the retrospective nature of our work and limited number of patients available at follow-up, we were unable to identify predictors of PM-HIV evolution to IBM, including initial PM-HIV viral load, HCV coinfection and p62 and/or TDP-43 staining (data not shown) on first muscle biopsy. To conclude, chronic HIV infection is associated with a large spectrum of myopathies. PM-HIV cases do not necessarily develop features consistent with IBM in all patients at follow-up. Predictors of PM-HIV to IBM evolution remain to be clarified. OL-C and LG contributed equally. Contributors Conceptualisation and design: OL-C, LG, OB and YA. Acquisition of data: OL-C, LG, OD, TM, SL, DB, AS, AB, TS, CD, GB, AR, OF, M-CM, CL, M-AV, DV, J-FB, TH, M-PC, ZA, TdB, BE, NB, OB and YA. Analysis and interpretation: OL-C, LG, OB and YA. Critical revision of the manuscript for important intellectual content: OL-C, LG, OD, TM, SL, DB, AS, AB, TS, CD, GB, AR, OF, M-CM, CL, M-AV, DV, J-FB, TH, M-PC, ZA, TdB, BE, NB, OB and YA. Competing interests OL-C is the recipient of Clinical Fellowship awards from the Université de Montréal Rheumatology Program - Abbvie Educational Grant and the Association des médecins rhumatologues du Québec - Visithan-Khy Educational Grant. Ethics approval The study was approved by local Ethics Committee (CPP Ile De France VI (2013-12-19), CCTIRS (N°14.323) and CNIL (915139)) for the use of medical information recorded in the myositis database for scientific purposes.